Millions of homes have been left without power this winter when severe ice and snow storms swept across the country. Don't let power outages leave your family in the dark or grind your business to a halt! The Emergency Backup Power packages keep your home or business powered up when the grid is knocked out by blizzards, ice storms and other natural disasters. 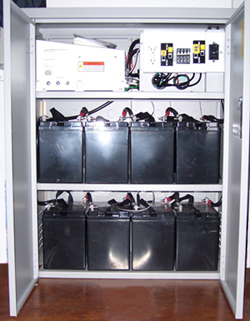 Battery Backup Power can also be added to an existing grid-tied solar power system. Any of the systems below can work alongside your existing gridtied solar system. The systems below can be charged by regular utility-provided electricity, by wind or gas generator, or by solar panels. These packages include attractive, lockable white powder coated steel battery enclosures. 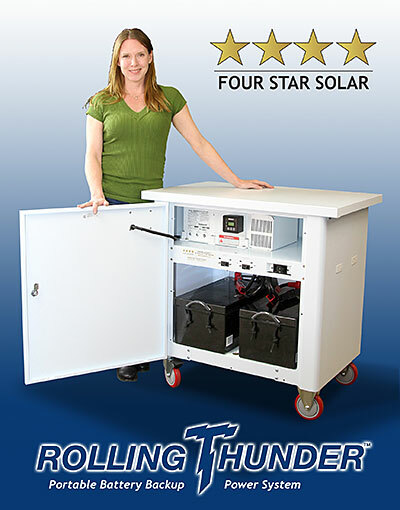 The products below provide backup power stored in batteries that can be charged and re-charged by the grid, by solar panels, or by generator. When planning your back-up power system, be aware that the back-up power can be sent to a sub-panel. The two panels may be connected through the inverter in the battery back-up system. You will have an AC line coming from your main service panel which is connected to the "AC in" on the back-up system. The "AC out" is then sent to the sub-panel only, not back to the main panel. During a power outage, power will be supplied only to the backed up sub-panel, not to the main panel. This requires that you relocate specific circuits that you wish to have powered when the grid is down, to the new sub-panel. This is best accomplished by a licensed electrician. The reason for wiring critical loads into a subpanel is twofold First, if you were to send the "AC out" from the back-up system to your main panel, you would be backfeeding a "down" grid. This is illegal and dangerous. Secondly, when the grid is "up", power will be flowing, unregulated, back through the "AC out" connection on the back-up system and could damage your electrical system. When the grid is "up", power will flow from the main panel through the battery back-up system to power the loads / circuits in the sub-panel. This power is limited by the power transfer capability of the inverter. If you need more current transfer capability for your backup up loads, you can parallel multiple inverters to increase the current flow. Wholesale Solar's technicians can pre-wire and test the inverter system in-house, before shipping, to insure that you have enough power. “Intense winter storms in January 2010 left us with 4 feet of snow and no power, water or heat. Our passive solar house with a gridtied solar electric system works great when there’s sun. Doesn’t work at all when the utility power is down. Of course, the irony of the fact that we sell battery backup systems and, in fact, have a warehouse full of the parts you need to set up these simple lifesavers hit us smack in the face. Oh well, oh well. The first couple of days with no power were okay. We moved stuff from the ‘frig to a cooler out in the snow. Our house held its heat pretty well, and we could cook on the propane fed kitchen stove. But by the third day of no power, the bedroom temps were around 40 degrees at night. Brrrrrrrrrr! Unlike many of the homes in this area, we do not have a wood-burning stove. Our hydronic baseboard heaters rely on electricity to power a pump. Time for action! We were lucky to have access to heavy-duty 200 amp hour 6-volt DC batteries. We picked up six UPG batteries and a Magnum sine wave inverter/charger from the warehouse and plopped them onto the bedroom floor close to our utility room. The UPG’s are sealed batteries so we didn’t have to worry about off gassing. The inverter’s job is to convert the DC electricity coming from the batteries into AC electricity, which can power our house. These Magnum inverters/chargers are really smart; they can charge batteries from grid electricity or from solar panels or from a gas or propane generator and then feed the electricity right where you need it. Luckily, also, when we wired our house we planned to add a battery back up system later. We had separated out the essential appliances we want to be able to power in emergency: the water pump, the heater pump for our hydronic baseboard heaters, and the plugs in our office so we can run computers and phone. But you can just as easily run a cord with multiple plugs from the backup power unit. From past experience living entirely off the grid with solar electricity, we knew that refrigerators and electrical appliances with heat elements are huge energy draws and so we did not plan to power them in an emergency. It took Mark about an hour to wire the batteries into a 12-volt configuration, connect them to the inverter/charger and run a wire to our breaker box. Flipped the switch and, bingo, the water pump started refilling the pressure tank, the heat pump started up, and the house heated up. We were able to run the essential appliances for the next two days simply on the energy from the batteries, without recharging them. If the power had been out for much longer we would have charged them with solar panels or with a gas generator. We really don’t like the idea of using a gas generator because they are messy, unreliable and hard to start (unless you spend really big bucks), and they depend on a non-renewable fuel that is in limited supply here during extreme weather conditions. A couple of weeks past the big storm, we’ve installed one of our Wholesale Solar battery backup systems that includes a Magnum Sinewave inverter and UPG sealed batteries in a slick attractive cabinet. We found room in a closet near the breaker box to put it in. We’ll remember this winter storm for a long time, and we’ll be better prepared next time. This handsome Midnite Solar battery enclosure with lock (shown at left) easily holds eight 6 volt batteries, the Magnum inverter and safety disconnects. The battery monitor is mounted on the wall in our hallway so we can keep an eye on the battery charge. Batteries for our system are kept charged by grid power.